Le seul honneur pour un artiste, c’est de n’en pas avoir | One quality, the finest. Léo Ferré, one of the greatest French language wordsmiths of the 20th century was born on August 24, 1916 in Monaco. One of his most haunting songs is Avec le temps, first recorded in 1970, shown here with the original lyrics alongside an English translation. Gifted as a child soprano, he studied at a boarding school in order to sing, but he was always marked by the loneliness of those years. His father refused to let him enter the Conservatory of Music, and instead he went to Paris to study law. He continued his musical studies on the side and began composing in earnest, sacred music at first. He returned to Monaco after the war. An encounter with Edith Piaf in 1945 would prove to be decisive as she encouraged him to go to Paris to try his luck in the music world. For seven years, he worked obscure music halls where he was paid a pittance. He began to spend time with Spanish anarchists. Some of the big names of the day began to record his music, including Piaf who had, after all, encouraged him to make the move, but also Henri Salvador and Catherine Sauvage. He did not experience success until Sauvage had a big hit with a song other musicians had turned down, “Paris Canaille”. Ferré used his improved finances to devote time write a classical oratorio. Throughout his career, he kept one foot in the classical world and one in the domain of chanson française, the popular music of the day that features beautifully drafted lyrics. For a couple of weeks the following year, he was the opening act for Josephine Baker singing his own compositions – apparently, he was not a crowd favorite. He was extremely prolific, steadily recording and even publishing a book of poetry. More than one album was an homage to the poets Charles Baudelaire and Guillaume Apollinaire. Ferré’s style is impossible to pin down; he was sarcastic and romantic, anarchistic and tender, misogynistic and passionate. Some of his songs, such as “Thank You Satan”, were so radical that they were not released due to censorship. He captured the mood of change and rebellion of 1968 of French youth and developed an enormous following among them. He continued to write, record, and perform until his death in 1993. 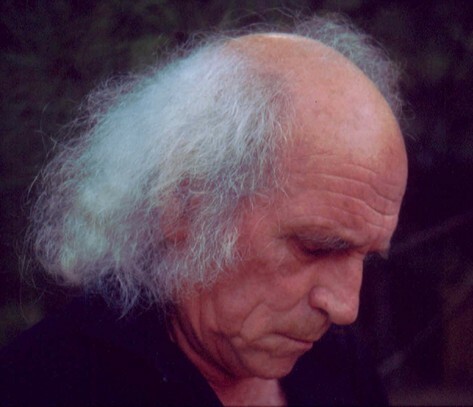 Léo Ferré systematically refused to accept awards, saying , “Le seul honneur pour un artiste, c’est de n’en pas avoir” (luh suhl honur poor uhn arteest, seh duh non paz avwar), which means “The only honor for an artist is not to have any.” This hasn’t stopped people from naming schools, town squares, and music halls after him. Perhaps the most touching tribute is a rose that bears his name; appropriately, its bi-colored, white, bordered in red, perfectly representing the many opposites in his life. This entry was posted in Music, People and tagged anarchist, Avec le temps, Catherine Sauvage, Edith Piaf, French composer, Guillaume Apollinaire, Henri Salvador, Josephine Baker, Léo Ferré, Le seul honneur pour un artiste c'est de n'en pas avoir, Paul Baudelaire. Bookmark the permalink. So right! I’ll change the blog ASAP. Pingback: Il est grand temps de rallumer les étoiles | One quality, the finest.